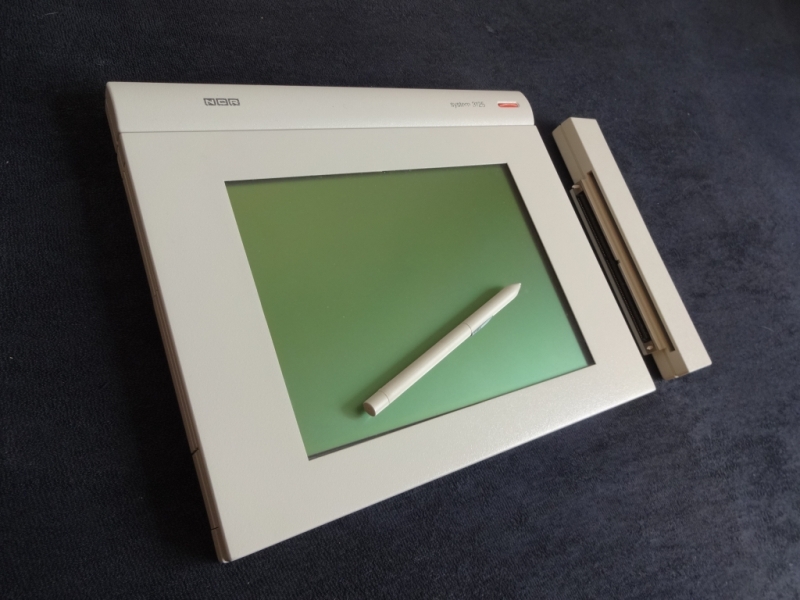 This mobile computer from 1991 is the second pen-based device (after Grid’s Gridpad from 1989), the first one with a separate pen (although it beats the Gridpad 2050 or Gripad SL by only a few months if any) and the first one from a big manufacturer. It is also one of the most expensive mobile computers with an initial price of a hefty $4795 (about $8200 in 2014 numbers). Finally, it is one of the few mobile computers designed in Germany (by NCR in Augsburg). Operating systems-wise the device is very flexible because it came out at the right time. As a PC it can run MSDOS plus NCR’s proprietary “PenOS”, a.k.a. the software that let you use the pen as an input device to enter text in a DOS environment. From 1992 onwards it could execute also (Microsoft) Pen Windows. Finally, even GO’s PenPoint was available for this computer. Some people even got (PC-)GEOS running on it. The design of the device is very sleek; it looks very streamlined and timeless. The pen for example is neatly contained in a small hidden compartment at the front. It was rewarded a “iF product design award 1992 – Best Of Category”. There seems to be a successor to this model with the Model 3130 NotePad in 1992. The 3130 had a backlit screen and a 40 or 60MB HDD and comes with Pen Windows. The weight increased by a pound. The price was about $4000. I am very unsure on the fate of this machine. It was expensive, not often mentioned in the news, and so I assume it was not very successful. Maybe it was also subject of the turmoil following the takeover by AT&T in 1991/1992. In the insightful series of confronting today’s children with oldstyle technology, today: Kids react to Old Computers. Very funny and thought-provoking. Why did we accept that crap at that time? The answer is, of course, because nothing better existed at that time at that price point. The WD-900 is the main board of a very rare computer whose CPU can execute P-Code (compiled from Pascal) directly. Before I come back to this computer please allow me a short detour 🙂 . There are few computer architectures that aim at executing code that is closer to a certain programming language directly on the CPU. And none of them were successful in the sense that they sold to a larger extend because simply the technical progress on CPUs that do not have to obey such restrictions is faster than for these special CPUs. As a result, executing the programming language on general CPUs of the next generation is faster than doing it on the special CPU. Lisp machines did have some commercial success, but vanished in the early 90s. Prolog machines never came out commercially although their development was one of the promises of the Fifth Generation projects. Forth is considered by some not so much a high-level programming language, but something very close to computer hardware. There are still some interesting Fort CPUs products, so it’s probably more the low interest in Forth that leads to a low interest in Forth hardware (don’t get me wrong – I love Forth). In contrast to that, Java is a high-interest programming language. Now, Java does not need to be executed directly on a CPU as it is often compiled into “Bytecode” anyway. Bytecode is a stack-oriented language like Forth. Of course, in contrast to Forth Java supports e.g. objects, but the principle is the same. Bytecode is a much simpler language than Java and better suited to be executed in hardware. Now, the concept of Bytecode was not invented by Java. It existed long before Java, notably as the runtime system of UCSD Pascal, and now we are back at the WD-900. The main use of this CPU was as the processor in DECs LSI-11 computer, a compact, integrated version of the PDP-11 minicomputer. As the CPU was micro-coded and as the microcode was stored in one or more separate chips, it was easy to let the CPU execute a different command set by switching the microcode storage chips. The difference was in the CP2161 control chip (and of course the MICROMs). Though the CP2151 contained multiple registers, but as the the p-code implementation was a pure stack machine, it did not use the registers. In 1979, the competition were mainly 8bit machines. As a result, the MicroEngine outperformed e.g. a Z80-based machine at the same clock speed by almost a factor of 10. Of course, later 16bit machines like the 68000-based HP9836 (at 8 MHz, sold from 1981 for $11950) were faster by a factor of 3. Also, the performance advantage was eroded by the later availability of p-code to native machine code compilers. 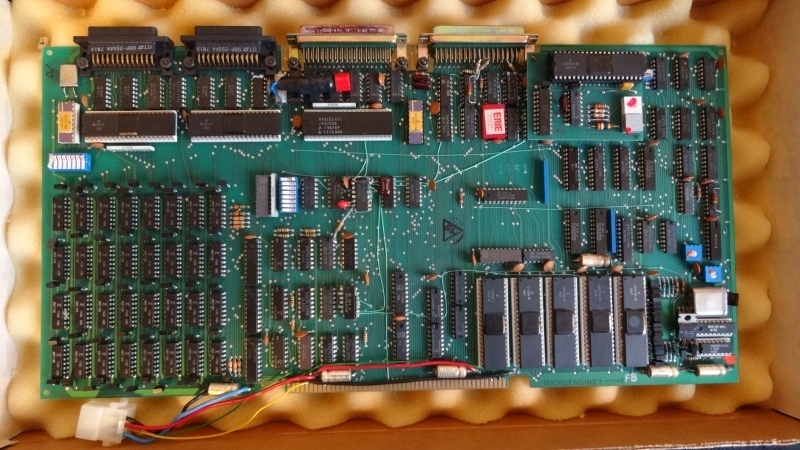 The WD-900 board that I own is reportedly a New Old Stock board bought as a spare for a WD-90 computer that never has been used. It is boxed. The WD-900 board contains all the electronics: the CPU, RAM, serial interfaces and a floppy disk controller (WD1791/2) for two disks. The WD-90 system contained a WD-900 board and a power supply. The (up to two) floppy disk drives needed to be attached externally.